Activated Charcoal seems like it's the latest wellbeing discovery but it actually dates back to 1608! With so many options now available to us, I thought you may like to explore the two most popular types - Coconut Shell and Binchotan. Activated Charcoal is the term used to describe a type of charcoal that has been created to increase its absorbency and ability to remove toxins, and is often used in health and medicine because of its many benefits. 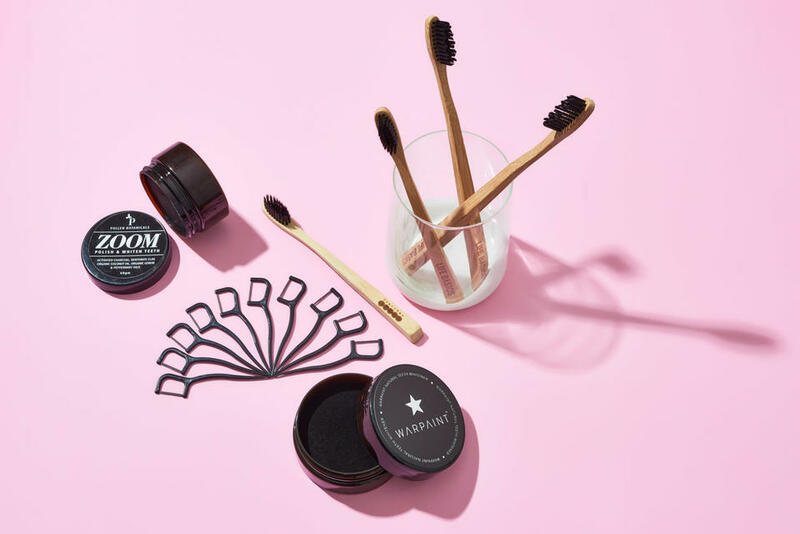 Activated Charcoal is made by burning a natural material such as coconut shells or wood and depriving it of oxygen, allowing steam and gases to ‘activate’ it and create a refined powder that has a highly porous surface. Two of the most popular types of activated charcoal are Coconut Shell and Binchotan, both used for their high quality, ultra-fine powder. The tiny pores in Activated Charcoal have the ability to remove toxins through a process called ‘adsorption’, whereby toxic particles are attracted to and bind to the surface of the charcoal, effectively removing toxins, poisons, harmful chemicals as well as uncomfortable gases within the body. What is Coconut Shell Charcoal? Activated Coconut Shell Charcoal is made from mature coconut shells, used for their ability to create a high quality refined and sustainable charcoal powder. The micro-pores of Coconut Shell Charcoal can trap a range of contaminants of different sizes, making this type of Activated Charcoal highly popular for use in health and skin care products. Using Activated Charcoal made from Coconut Shells is preferred by many brands as coconuts are an abundant and renewable source from which charcoal can be made year-round. 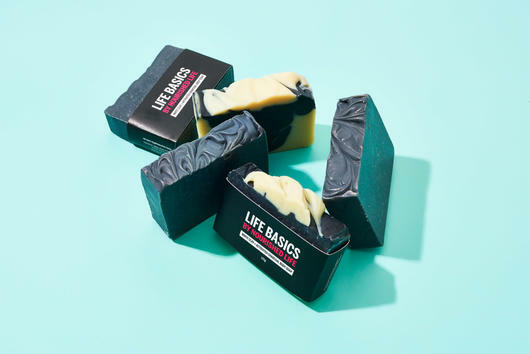 The Life Basics Activated Charcoal Body Soap contains this type of activated charcoal to provide a deep cleanse, remove dirt and absorb impurities. This nourishing soap bar also contains Olive and Coconut oils as well as Shea Butter to provide hydration and moisture to dry skin. The Charcoal lightly and gently buffs and exfoliates skin, removing dead skin cells and ensuring skin is left smooth and soft. This creamy soap also smells delicious thanks to the minty aroma of Peppermint Oil! As well as being a great body cleanser, Coconut Shell Charcoal is also fantastic for cleaning and whitening teeth! 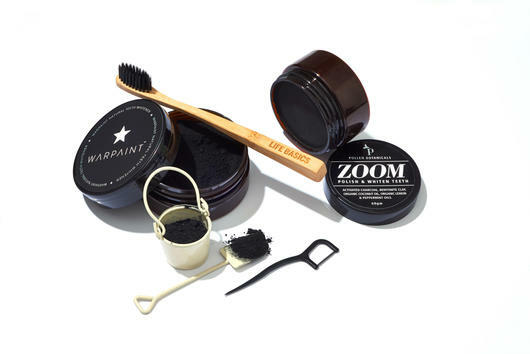 The all-natural Warpaint Natural Teeth Whitening Powder contains Activated Coconut Shell Charcoal along with Bentonite Clay and herbal extracts to effectively eliminate bad bacteria, help fight tooth decay and maintain healthy oral pH levels. This fine, food grade charcoal coloured powder can whiten and remineralise teeth and does not harm the enamel. Coconut Shell Charcoal absorbs toxins and removes stubborn stains and discolouration, making it ideal for coffee and tea drinkers! Mix a small amount with Coconut Oil to make a paste and use a couple of times a week in place of toothpaste to maintain healthy teeth and gums! The deeply cleansing My Magic Mud Peppermint Whitening Toothpaste contains Activated Coconut Shell Charcoal to whiten teeth and freshen breath in a funky charcoal coloured paste. Bentonite Clay and Diatomaceous Earth gently cleanse and polish teeth and gums, providing a deep cleanse without damaging enamel, while Peppermint, Orange and Rosemary Oils soothe gums and remove bacteria. The Buddy Activated Charcoal Scrub contains Coconut Shell Charcoal along with Sugar, Kaolin Clay, Jojoba and Coconut Oil for a deeply cleansing and nourishing body exfoliant. Thanks to the cleansing properties of Coconut Shell Charcoal, this enriching scrub helps to remove dirt, impurities and dead skin cells from the surface of the skin as well as help retain its moisture and balance oiliness. This vitamin and mineral rich scrub also smells delicious thanks to the minty freshness of Peppermint Oil! Binchotan Charcoal, also known as White Charcoal, is made from the branches of Japanese oak trees using a traditional method. The wood is slowly burned at high temperatures and deprived of oxygen in a kiln over a period of weeks until it has turned into carbon. The oak branches are carefully and sustainably selected by artisans who determine its maturity, ensuring the process is sustainable and environmentally friendly. 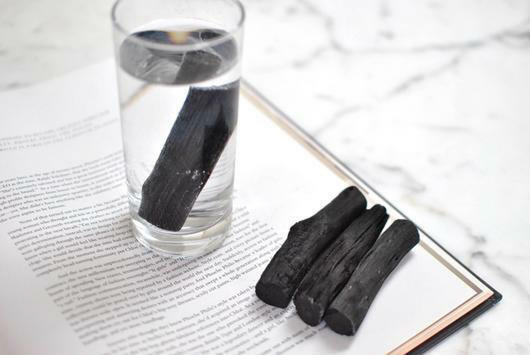 The Binchotan Charcoal surface is made up of macro and micro pores which allow the charcoal to attract and absorb a range of unwanted particles in water or the human body, which is why Binchotan is such a highly prized ingredient in organic products! The Life Basics Bamboo & Charcoal Toothbrush harnesses the natural antibacterial and antifungal properties of Binchotan Charcoal, known for its ability to naturally whiten teeth. 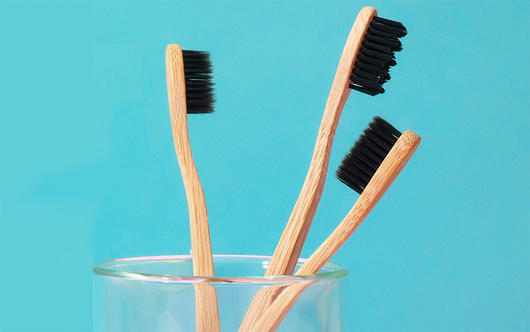 The bristles of each toothbrush are infused with Binchotan Charcoal to clean and deodorise the mouth, eliminating the bacteria that cause bad breath as well as absorbing and removing chlorine from tap water. Brushing daily with Binchotan Charcoal brightens teeth, freshens breath and reduces plaque build up. These biodegradable brushes are available in soft and medium bristle as well as a smaller kids’ size! Binchotan is known for its ability to naturally filter water by absorbing any chemicals to create pure, fresh, great tasting water. The eco-friendly Happy Coal Binchotan sticks remove chemicals such as chlorine as well as heavy metals. Just add one stick to a jug or bottle of water and allow to chill for several hours. These amazing sticks alkalise water by raising pH levels, last for at least two months before they need replacing, and can even be used in the fridge as highly absorbent air filters! The Dr Brite Vitamin C Infused Whitening Toothpaste uses Binchotan Charcoal in combination with Coconut Oil and Vitamin C to whiten teeth, prevent plaque build up and encourage healthy gums in a refreshing minty toothpaste. Created by a dentist and a surgeon, this creamy white coloured mineral toothpaste utilises Binchotan Charcoal in a paste form as an alternative to the sometimes-messy charcoal powder whiteners, and can be used daily to maintain healthy teeth and gums. Bamboo Charcoal is made from the carbonised branches of rapidly growing Bamboo plants, making it another sustainable type of Activated Charcoal! The surface of Bamboo Charcoal contains tiny holes which attract odours and moisture, making this type of Charcoal effective at deodorising and absorbing excess moisture. 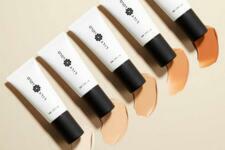 It can be used to purify water or air as well as control humidity levels. 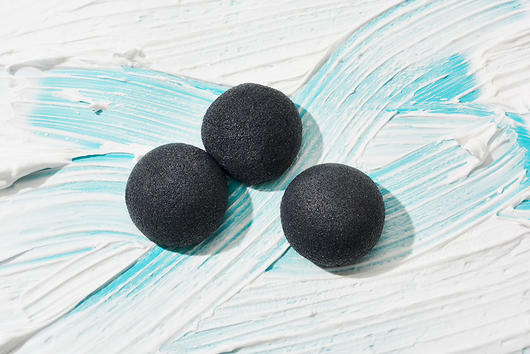 The Life Basics Konjac Sponge - Bamboo Charcoal is made using Activated Bamboo Charcoal to help magnetically remove dirt and grime from your face! This cleansing sponge is naturally alkalising and gently cleanses and exfoliates the skin to remove excess oil and build up in pores as well as makeup.